This is my first time making shortbread cookies. I had never really had much interest... as you know, Sugar Cookies are my specialty. I thought, what could be better than a Sugar Cookie? After mowing through a box of Girl Scout Peanut Butter Sandwich Cookies, I got addicted to that crumbly, sandy texture of shortbread. 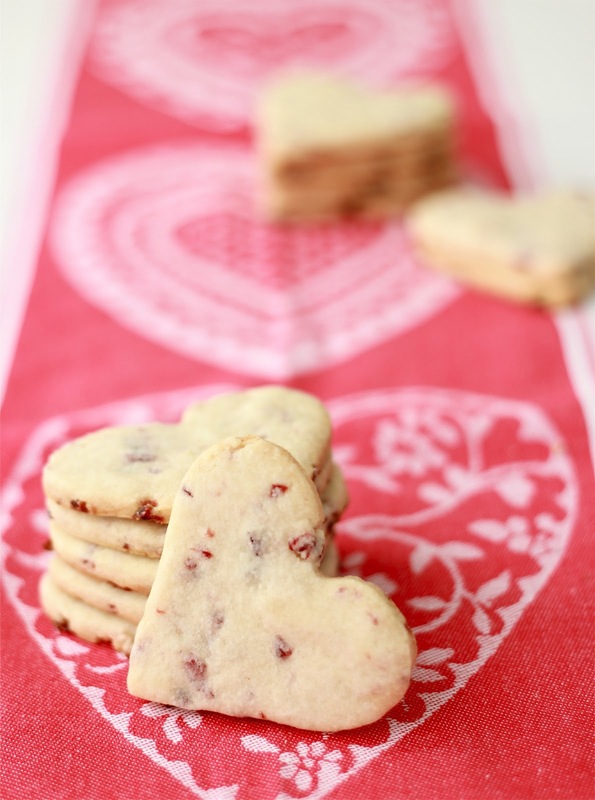 Combine that with, Valentine's Day and a craving for the Cherry Almond Cupcakes I made last Spring... boom, Cherry Almond Shortbread Heart Cookies are born! 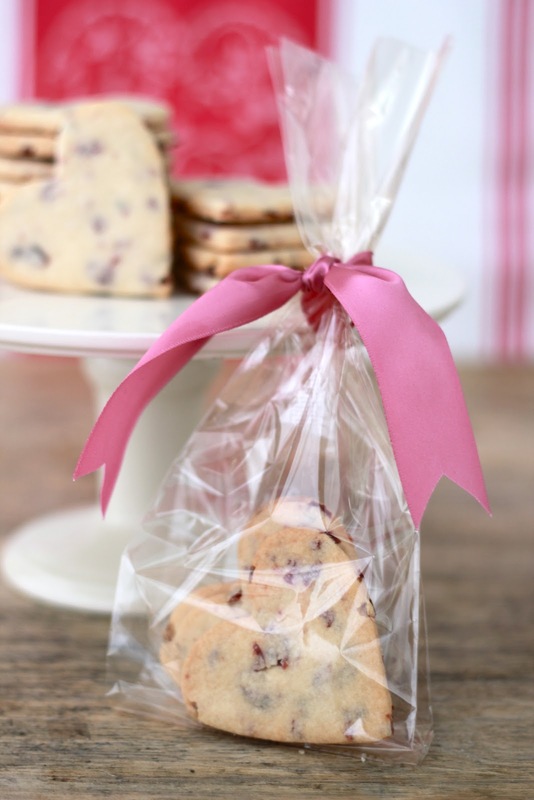 These not to sweet, crumbly, buttery, sophisticated cookies are the perfect Adult cookie. They have a delicate texture and flavor that overly decadent cookies (think double chocolate chunk...) can't match. 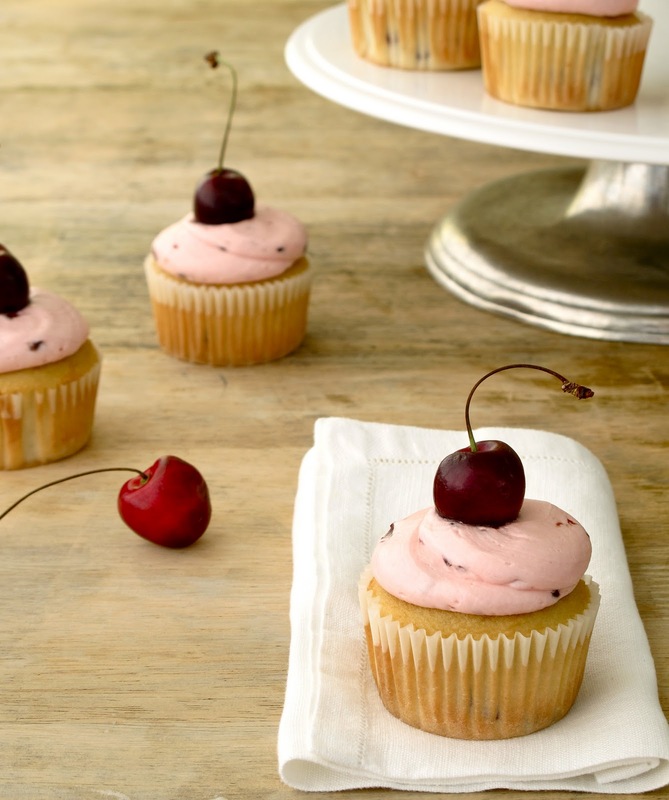 The addition of dried cherries gives a touch or red and tartness that is magical! And like most good things in life, they are simple. Only a couple of ingredients. No leavening, no eggs. Just a classic and simple cookie. Package these in cellophane bags (you can buy here in my online store) with a ribbon and give them to your lady friends or serve them with coffee for dessert at your next bridge party. They are 'that' kind of cookie. In a mixer, cream together butter and sugar for 3 minutes. Add vanilla and almond. Slowly stir in flour and salt. Mix until mixture begins to come together into a ball. Add diced cherries. Dump the mixture onto a floured surface and form into a disk. Wrap in plastic wrap and chill for 20 minutes (if you have time). Roll out the dough to 1/4 inch (I like them thick) and cut into shapes. Bake at 350 degrees on a silpat lined baking sheet for 18-20 minutes, until the edges brown just slightly. Delicious. Might have just discovered what to give to the teachers at the Valentine's Party! Dried cherries are in my next Costco run. These look fabulous. I've never purchased dried cherries but, being the lover of shortbread that I am, I now need to. Any brand you suggest over another? How many cookies do you get from one batch? They look delicious and would like to make them for my volunteer group at the library. oh! and only baked them for 14 minutes on convection! I made these with my daughter today! She loved helping me use the rolling pin and cutting the cookies! Made for super cute pix and a happy daddy who got a yummy valentines cookie from a yummy little girl! :) Thx for the recipe! Love your biscuits . look so delicious.